Taco Bell garter? Check. Sauce packet wedding bouquet? Check. For just $600, couples can have a Taco Bell-themed wedding at the new Las Vegas Strip Cantina chapel that opens this summer. 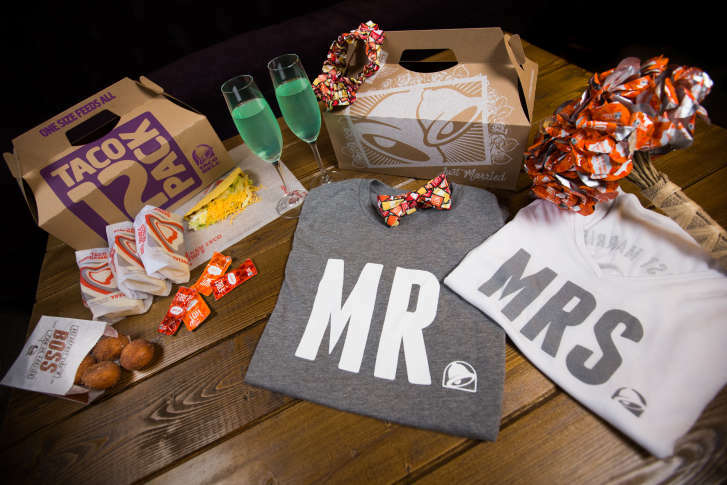 WASHINGTON — If you’ve always dreamed of a Taco Bell-themed wedding, your chalupa has come in. Taco Bell is opening a chapel in its Las Vegas Strip Cantina location and has put together an entire wedding package couples can order right off the menu. It includes a Taco Bell garter, bow tie, sauce packet wedding bouquet, “Just Married” T-shirts, Taco Bell Champagne flutes and a Cinnabon Delights wedding cake. Your first meal as newlyweds will be a Taco 12-Pack. The wedding package costs $600 and includes a full ceremony and officiant. The Taco Bell weddings are through a partnership with pop-up wedding planner Flora Pop. The fast-food chain is running a contest with one winning couple getting an all-expenses paid trip to Las Vegas, Nevada and lodging at Planet Hollywood to be the first couple to have a Taco Bell wedding. The Taco Bell Cantina wedding chapel opens this summer.